You all know I'm a mad, crazy smoothie fan. To me, it's the number one way to get a whole lot of amazing ingredients all in one meal that tastes half decent. But I understand we don't always feel like smoothies all year round, or every day. Unless your me, of course. I have recently started thinking outside of the box when it comes to boosting meals. Add spinach to things that maybe you wouldn't normally (what could go wrong? 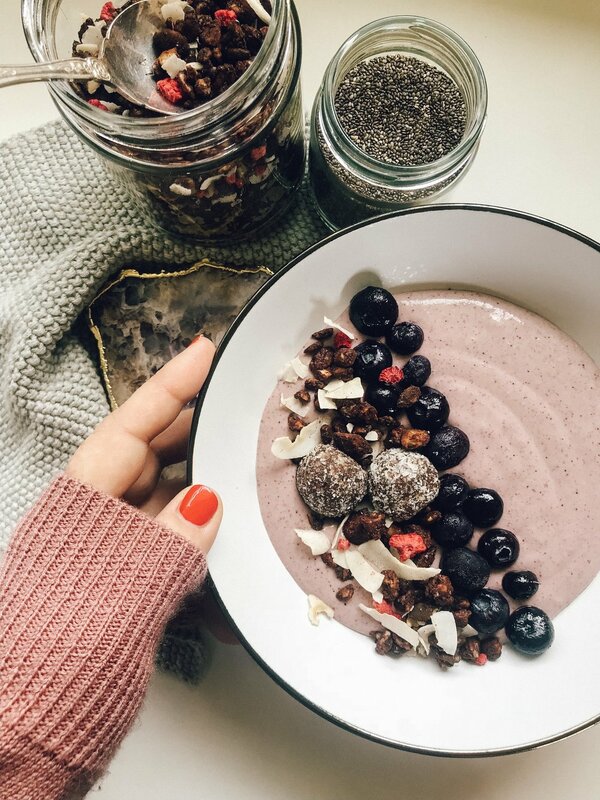 ), the amazing overnight oats recipe featuring chia seeds, fruit and LSA mix, or just packing in loads of grated veges into meatballs, patties, egg slices etc. You get the message. My latest trick is boosting my coconut yogurt, or just plain unsweetened if that's what you like. I love my nutra bullet and have a tendency to blend everything in sight, so today I got busy experimenting with upping the nutrition in one of my fave things - coconut yogurt. The recipe below is really yummy and turns it from being a snack into a meal, I turned it into a bowl so I could add a bunch of toppings, but you could use it as the topping on your oats, granola or dessert - it's that good. Think of things that are good for you and experiment with blending them in to the yogurt. I popped in some chia seeds, a banana, some blueberries and topped with a nutty cacao blend and some more blueberries + chia seeds. I also included some of The Wholesome Co immune health tub blend, which has a berry flavour and was so perfect for this and I know it has so many incredible ingredients to help boost my immunity at this time of year. These health tubs are basically natural blends of different ground ingredients designed to help different areas - she has designed a hormone balancing one, glowing skin, breastfeeding, pregnancy and immunity. I love this idea because it is just using natural foods to help boost your system and they are so easy to add to your diet via smoothies, baking or as a topping. I am trying to do this more and more and am on a journey of learning about what different foods can do for you - it's a big wide world! Of course, you can create these blends yourself or buy specific items to help you with whatever you need, I just like the convenience of getting directly from The Wholesome Co AND ranging from $29.99 and $39.99 I am not sure you could buy all the ingredients for that! Here's my recipe for my boosted coconut yogurt, feel free to omit the immunity blend, or if you'd like to try, use 'balanceproject' as a code for 15% off. This is not a sponsored blog by the way, I just love this stuff! Pop everything in the bullet and give it a whiz! Add to your fave granola, or top with your fave granola - whichever you prefer.